;Something has happened to my life lately, it is disappearing before my eyes and there doesn’t seem to be much I can do about it. I keep getting busier and busier: wake up, school lunch, school drop off, traffic, work, traffic, school pick up, after school activities, afternoon tea, homework, prepare dinner, eat dinner, tidy up after dinner, snack for after dinner, fall onto the couch, crawl to bed and then thankful that it can all start again the next morning. Sound familiar? I’m an ideas person. I have soooo many ideas but I don’t have the time to put them all together, so I have lots of projects on the go at the same time. Very frustrating! But life isn’t the kind of thing to be lived one step after the other, certainly mine isn’t. It’s more like a dance…a little this way, then that, then a bit of mad crazy foot work I was unprepared for; then it might slow to more of a waltz again. And of course the odd Rave or two thrown in for good measure. But it’s funny how I never feel like I know the steps to any of the dances. Just when I feel I’ve got it all under control then a new piece of music begins and I’m madly scampering about again. Frustrating certainly, but it is my life and I’m oh so blessed to be able to live the life I live. And just when I think I can’t get any busier, I come up with another project to throw myself into. I’ve barely seen the inside of my kitchen lately but even that sounds strange to my own ears as with a pre-teen boy I seem to be making food more often than not and can’t escape the kitchen! Breakfast, school lunch, lunch, afternoon tea, snack before dinner or activity, dinner, post-dinner snack……my creative juices seem to have run dry and I’ve fallen into the trap of relying heavily on bread. Toast, frozen bread (yes, he loves to eat it straight from the freezer), snackwiches, grilled cheese, more toast…thankfully he isn’t gluten intolerant, but at this rate, it won’t be long. So I’ve begun digging out a few old favourites again to inspire me and came across this one. I know it doesn’t solve my perpetual snack crisis, but it at least meant I didn’t have to think too much about what to prepare for dinner. 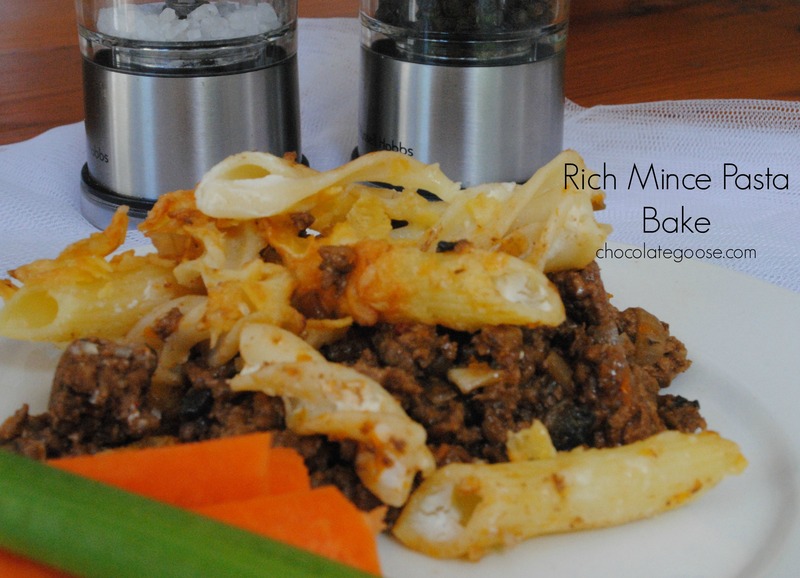 And as the weather has turned quite cold again since early June, what is more comforting and easy than the pairing of pasta and mince? This recipe comes from a book* I was given years ago when we started to introduce solid food to my baby’s diet. This is apparently suitable for babies from about 8 – 9 months onwards, just make sure that the pasta pieces are cut up quite fine. It also doesn’t have much seasoning. No salt or pepper is in the recipe, but you can add as you see fit. I do. On the stove-top, heat the oil in a frying pan and gently fry the chopped onion until it is translucent and soft. Add the mince and brown well, mashing it a little so it is a fine crumbly texture. Then add the mushrooms and vegetables and stir-fry for 2 – 3 minutes. Stir in the remaining ingredients and bring to a slow boil. Season to taste if using salt & pepper. Transfer the mixture to an ovenproof dish. Meanwhile, cook the pasta in boiling water until tender, following the instructions on the packet (about 10 – 12 minutes); then drain and stir in the cream cheese and half the grated cheese. Spread it over the top of the mince and sprinkle with the remaining cheese. Bake for 15 – 20 minutes or until the top is golden brown. Serve with a side salad or other winter veggies in season. *Published by the New Zealand Beef and Lamb Association.